YOUNGSTOWN, Ohio –Thirty-five years ago, Ed Geddes seized on a revolutionary idea while employed at a pressure-washing company in Arkansas. Instead of manufacturing and mixing large drums of cleaning solutions and shipping them to customers across the country, why not just ship the ingredients in a kit and allow the end-user to blend them by just adding water? The concept stuck with him. In 1983, he moved back to the Mahoning Valley and established Vector Laboratories – now Vector Chemicals Inc. – at 316 Alexander St. in Youngstown. Today, the company supplies customers nationwide with cleaning solutions for the industrial, commercial and consumer markets. The drum pack allows the company and its customers to save money on shipping, an innovation that has prepared Vector for growth in a very big industry. Hirschochs, born in Germany and raised in Puerto Rico, is a U.S. Army veteran and started working at the company during the late 1980s until 1993, when she enrolled at Youngstown State University. In 1998, she returned to the company as its president. Since the company was founded 35 years ago, it’s built a steady clientele of loyal customers. However, Hirschochs acknowledges one of Vector’s shortcomings was its ability to market the company’s products effectively to a wider array of customers, especially through digital platforms. “Marketing isn’t my strong point,” she says. Enter Brendon Coughlin, a serial entrepreneur who recently relocated to northeastern Ohio from Texas and sees nothing but growth potential for the company. “We want to take a 35-year-old company and take advantage of this $80 billion market,” he says. After assessing its operations, Coughlin and a new marketing team made an offer to some of the minority partners and negotiated an ownership stake in Vector. “All of our interests are aligned to grow this business,” he says. Investing in Vector made sense to Coughlin since the cost of doing business in Youngstown is far more agreeable than other areas of the country. Plus, the company has a great idea that, when properly marketed, could lift business fourfold, he projects. Coughlin has partnered with two marketing companies to refresh the business – Desidara, based in Uniontown, and Map Forward Digital, based in Medina County – the principals of which also own equity in the company, he says. The objective is to first update the logo and website, and introduce a more user-friendly online ordering tool so customers everywhere can access Vector’s products. Mobile accessibility plays an important role in the new marketing strategy, Coughlin says. Instead of building a website that is mobile optimized, Vector has instead created a mobile website that is computer optimized – retaining the look and feel of buying products over a mobile device. “Our website approach is pretty unique in that we are following the trend that people search more and more on their mobile devices than their computer,” he says. Among the areas that Coughlin would like to see grow is the business’ local presence. “We’ve got customers all across the country, but we’re not capitalizing in the Youngstown market right now,” he notes. Hirschochs says the majority of business is through sales of its drum pack products. The company buys the raw chemicals and packages them with blending and safety instructions. 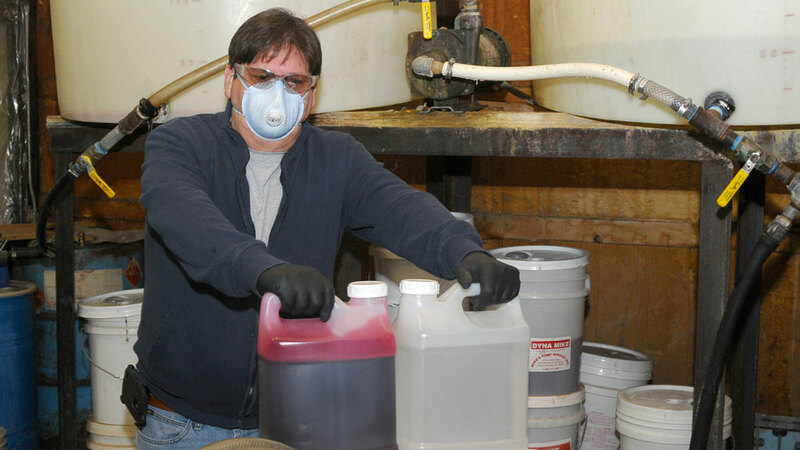 Chemicals, like those mixed by Bob Barker, can be made in large, industrial volumes or small batches for specific uses. Vector also packages smaller kits that are roughly eight pounds. All of the drum packs can be delivered through shipping services such as FedEx and United Parcel Service. Other customers prefer Vector’s proprietary cleaning solution mixed at the company’s plant and shipped in drums, Hirschochs says. Vector’s 12,000-square-foot building on Alexander Street serves as its main production hub, where chemicals are blended into the final cleaning product. Large mixing tanks are used to combine water with assorted ingredients such as lye, for example, and create a custom cleaning solution or detergent used in commercial applications in the automotive industry, manufacturers, residential markets, construction and a wide array of other uses. What makes Vector an interesting investment is that the company is flexible in that it can supply products for larger industrial customers but can also accommodate smaller users that may not require large volumes. Coughlin says that once the new marketing initiative rolls out and additional business is generated, the company could then concentrate on modernizing the plant and upgrading its production capabilities. Currently, the business employs six, including the three new equity investors. Coughlin emphasizes that the low cost of doing business in Youngstown, the scope and size of an $80 billion national market and business model provides a perfect opportunity to grow and expand the company. Moreover, Coughlin sees this as an opportunity to take a mature business and take it to new heights in the heart of the Mahoning Valley. “I want to be part of a business that is part of the revitalization of Youngstown,” he says. Watch our 3 Minutes With interview with Hirschochs and Coughlin for more on the company’s history, innovations it’s made over the years and where it is heading. Pictured: Improving the company’s marketing efforts, especially in the Mahoning Valley, are among the top priorities for Vector Chemicals office manager Patty Meehan (left), general manager Brendon Coughlin and President Claudia Hirschochs.